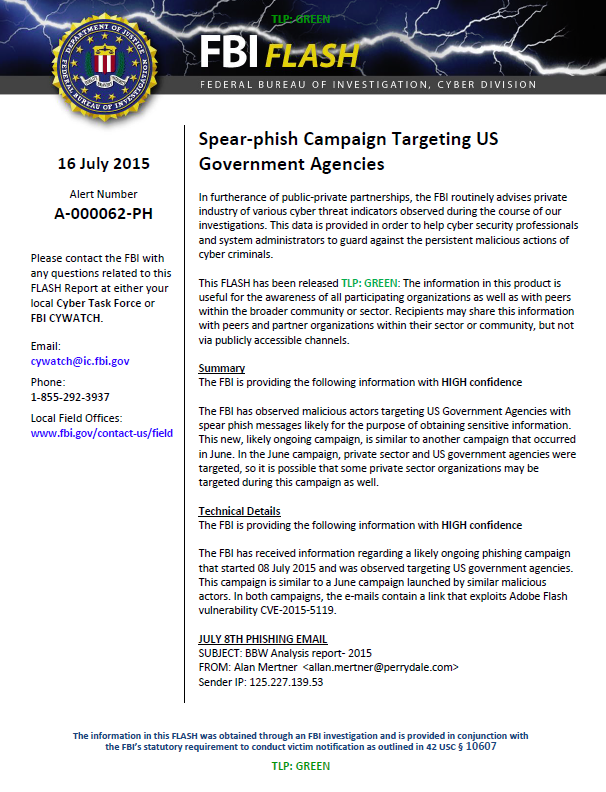 The following bulletin from the FBI Cyber Division discusses a spearphishing campaign targeting U.S. government agencies in June and July of 2015. The campaign utilized a Adobe Flash exploit based on vulnerability CVE-2015-5119 that was discovered in the 400GB data archive from hacked Italian surveillance technology company Hacking Team that was released publicly earlier this month. The exploit was being sold as a product of Hacking Team and was listed in their product knowledge base. The bulletin notes that the Flash exploit was being used in phishing emails in June 2015 despite the fact that the Hacking Team data was only made public on July 5, 2015. The FBI has observed malicious actors targeting US Government Agencies with spear phish messages likely for the purpose of obtaining sensitive information. This new, likely ongoing campaign, is similar to another campaign that occurred in June. In the June campaign, private sector and US government agencies were targeted, so it is possible that some private sector organizations may be targeted during this campaign as well. The FBI has received information regarding a likely ongoing phishing campaign that started 08 July 2015 and was observed targeting US government agencies. This campaign is similar to a June campaign launched by similar malicious actors. In both campaigns, the e-mails contain a link that exploits Adobe Flash vulnerability CVE-2015-5119. In June, similar malicious actors launched another phishing campaign targeting US Government Agencies and private sector companies involved in Information Technology/Telecommunications, Aerospace, Construction, Engineering and Transportation. 2015 Program Year Kick Off! later, the review will turn into a member review! Additional indicators recently obtained. Network traffic associated with the following IP addresses/domains should be analyzed for malware activity.